Boston, Massachusetts: Little, Brown and Company.. Very Good+ in Very Good+ dust jacket. 1952. Hardcover. 12mo - 18.5 x 12.5 cm. ; 123 pp. An Atlantic Monthly Press Book, seventh printing. "This is more than a book of recipes. . . it is a complete, thoughtful guide to home candy making, including lists for equipment, general discussions of cooking techniques and instructions on storing, packing and even mailing the finished product." Index. A great 1950's era photo on the back of the dust jacket showing the author making candy with a group of children. Former owner's name on front free endpaper, otherwise, a clean, sturdy volume. Dust jacket has very minor soiling. ; Book Club Edition . New York: Atheneum.. Very Good+ in Very Good+ dust jacket. 1981. First Edition. Hardcover. 0689111428 . 8vo - 21 x 14.5 cm. ; 278 pp. 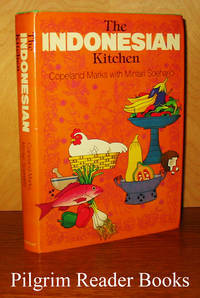 According to the fly leaf: "This is the first book of authenic Indonesian recipes to be prepared specifically for use in the American kitchen. . . Boasting four great external influences - Indian, Chinese, Arab and Dutch Colonial - Indonesian cooking is richer, spicier and more varied than any other Asian cuisine. Based upon the rijsttafel, which offers small quantities of various dishes. . ." There is even a small chapter on the medicinal use of spices. Marks was a textile importer traveling extensively in Indonesia for business who also fell in love with the local foods. Socharjo was his local guide-in-the-kitchen in this endeavour. Index. Green cloth-covered boards with gilt spine lettering, red text block head. Very minor shelfwear on boards; a clean, tight volume. Dust jacket has a bit of edgewear, front flap price clipped. A nice copy of this book. .
New York. : Holt, Rinehart and Winston.. Very Good with no dust jacket. 1965. First Edition. Hardcover. 8vo - 21 x 14 cm. ; x - 244 pp. Pictorial cloth over boards. Stated first edition. Not the new-fangled modern way with freeze-dried this and that, shrink-wrapped energy foods and space-age cooking doo-dads but how to cook using real ingredients over a fire. 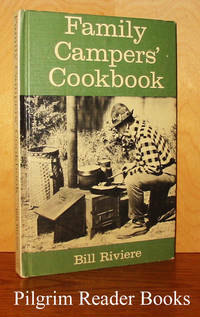 Illustrated with black and white photographs and chock full of recipes with various cooking methods. Slight wear to the externals (board fore corners and spine tips) with some soiling on the back cover, otherwise clean with a tight binding. One appendix with cooking definitions and terms, useful measurements, equipment and food staples followed by a 3 page recipe index. .
Chicago, Illinois. : Siegel-Cooper Company.. Poor. Softcover. 8vo - 20 x 13.5 cm. ; 96 pp. Published circa late 1800's, by the Chicago department store, Siegel, Cooper & Company which opened in 1887. Recipes for Cooking Furnished by Kineley's. S. Ettinger, printer. Advertisements of the day interspersed with recipes for freckles, cold cream and griddle cakes. Cover and first and last pages detached from book, first page missing a section; rest of pages stained and worn but well-attached. Overall this book is a fragile bit of history. .
Harmony Hall, Milnthorpe, Cumbria, UK: Cicerone Press.. Very Good+. 1985. Softcover. 902363603 . 12mo - 18 x 12 cm. ; 96 pp. Besides recipes, the author explores the links between customs, festivals and traditional food in Cheshire, Cumberland, Durham, Lancashire, Northumberland, Westmorland, and Yorkshire. 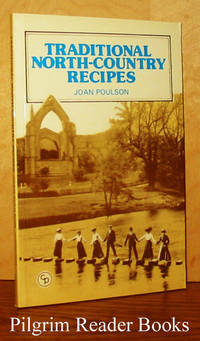 Poulson is a children's writer, dramatist and poet who began her career writing fourteen books on regional foods in England. Illustrated with drawings and photos. A clean, tight copy. .
St. Paul, Minnesota. : University of Minnesota, Agricultural Extension Service.. Very Good-. 1950. Softcover. 8vo - 23 x 15.5 cm. ; 23 pp. Photographic paper covers in a saddle stapled binding. 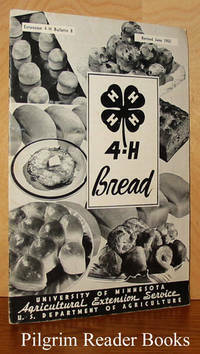 A general and thorough introduction to bread making of all types, illustrated with many black and white photographs. Previous owner's (?) name on the tail margin of page 17. This is the 4-H Extension Bulletin #8 and is a later and revised edition. The covers show some minor overall wear and light soiling on the back cover. .
New York. : Galahad Books.. Very Good+ in Very Good dust jacket. 1965. Hardcover. 0883651432 . 8vo - 21 x 13 cm. ; 192 pp. Author was taught to make bread by his father, a German master bread baker. 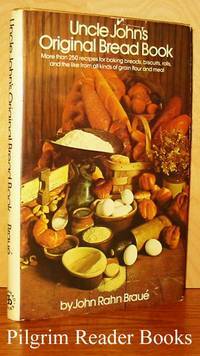 Here is a group of recipes collected by his family for generations along with a general discussion of breadmaking methods and different leavens. He even tells you how to home-render lard for use in baking. Text is clean and tight. Dust jacket is lightly rubbed with a bit of edgewear. .
Halifax, Nova Scotia. 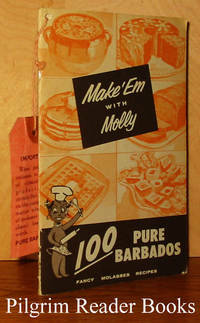 : Barbados Fancy Molasses Co.. Very Good+. Softcover. 8vo - 20.5 x 12.5 cm. ; 28 -  pp. Pictorial covers in a saddle stapled binding. The recipes are grouped into 11 sections: meats - vegetables, pies, cakes, cookies, gingerbreads, desserts, frosting - toppings - sauces, breads, miscellaneous, candies and special treats. The top spine corner is hole punched as issued with a tag threaded through advising that pure Barbados molasses always be used. Illustrated with small vignette drawings of a caricatured west Indian female chef very true to the times and most definitely frowned upon today. No date of publication is given though a guess of the 1930's might be close. Minor wear to the covers, otherwise very clean and tight. .
New York. : Alfred A. Knopf.. Near Fine. 1993. First Edition. Softcover. 0679748296 . 4to - 25.5 x 23 cm. ; xii - 146 -  pp. Stated first edition of this, the soft cover edition. 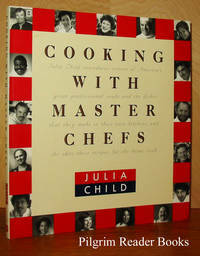 Signed by Julia Child on the first page (half-title page): "To Nancy, Julia Child". Signed on page 12 by Mary Lou Millikin and Susan Feniger: "Relish, Mary Lou Millikin" and "To Mom, your daughter is the best. Susan Feniger". Signed by Amy Ferguson-Ota on page 66: "Bon Kau Kau, Amy F. Ota". 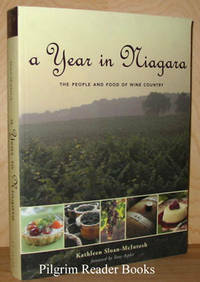 And lastly signed by Nancy Silverton on page 82: "To Nancy, Enjoy. Nancy Silverton". The Nancy to whom the book is inscribed is not known but may have been involved in the production of the PBS series of the same name. The book shows very mild wear to the cover edges and the lower fore corner has a small bump that has creased the page and cover corners at the very corner. 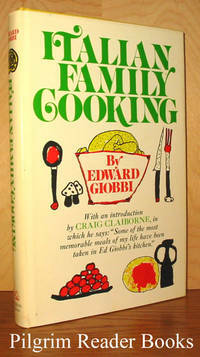 The book comes from the library of well known TV chef. ; Signed by Author . New York. : Lumen Publishers.. Very Good. 1952. Softcover. 8vo - 23 x 17.5 cm. ; Unpaginated with 108 pages. 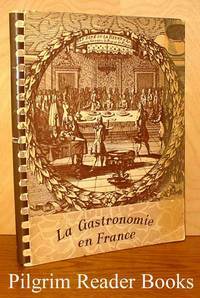 Recipes with directions on the versos and black and white photographs of local scenes from France on the rectos. Brown plastic coil binding. Mild wear to the card stock covers with several pages (8 to be exact) have dog-eared creases on the top fore edge corner. Otherwise very clean. .
New York: Random House. Very Good+ in Very Good+ dust jacket. 1971. Hardcover. 0394462424 . 8vo - 23 x 15.5 cm. ; xvii - 252 pp. Book club edition. 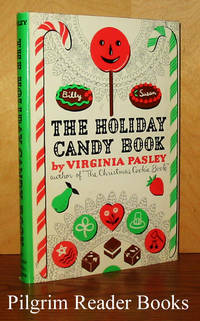 Illustrated colorfully by the Giobbi children and introduced by Craig Claiborne. Index. Dust jacket has very minor bit of wear; an unused copy of this book. .
New York: Holt, Rinehart and Winston.. Near Fine in Very Good+ dust jacket. 1984. Hardcover. 0030633125 . 8vo - 22.5 x 15.5 cm. ; 354 pp. BOMC. 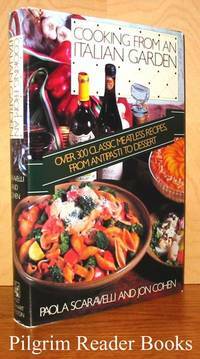 Over 300 classic meatless recipes, from antipasti to dessert. A vegetarian Italian cookbook. Minor lightwear on dust jacket; an unused copy of this book. .
Toronto, Ontario. : Canada, Ltd.. Good. Softcover. 8vo - 22 x 15.5 cm. ; 39, (11) pp. 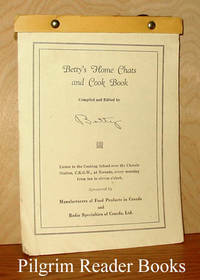 A small cookbook with many advertizements compiled and edited by "Betty". "Listen to the Cooking School over the Cheerio Station, C.K.G.W., at Toronto, every morning from ten to eleven o'clock." No publication date given. Bound at the top of the pages by brass pins, with a brown cord for hanging. Eleven pages of ads. Some stains throughout, small tears and corner creases, hand written recipes on reverse of last page. .
By Davy, Pamela and Shirley Deugo. Almonte, Ontario. : SAP. Very Good. 1987. Soft Cover. 096929560X . 8vo - 23 x 15.5 cm. ; 202 pp. A privately printed cookbook bound with a black plastic coil. 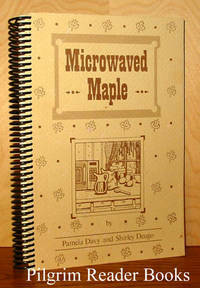 Recipes for foods with maple syrup cooked in a microwave oven. Deugo and her family run Fulton's Pancake House and Sugar Bush located near Pakenham, Ontario and Pamela Davy is the microwave expert. 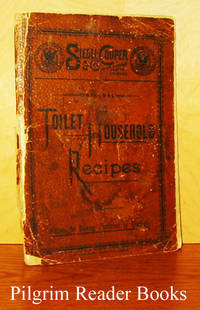 This cookbook has had some use so there is a little staining on a few pages. .
Robin Hood Flour Mills Ltd.. Very Good+. Soft Cover. 8vo - 23 x 15.5 cm. ; 24 pp. Pictorial card wraps. Very minor wear to corners and edges. 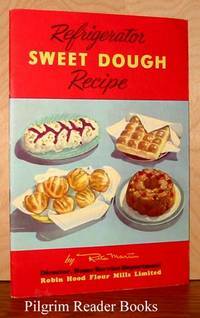 Full title is "Simplified Method for Making Refrigerator Sweet Dough". Complete with 4 varied and delicious recipes, will keep fresh and sweet in the refrigerator for 7 full days. The recipes included are Jelly Braid, Pan Buns, Fan Tans, and Hungarian Coffee Cake. Illustrated with lots of how-to black and white photographs. The shipping cost for this small item will be reduced when ordered. .